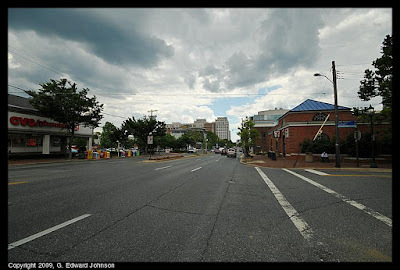 I was walking around Bethesda, MD today at lunch time and a huge bank of dark clouds started rolling in. Farther away you could still see blue sky. The clouds were threatening but didn't produce any rain. 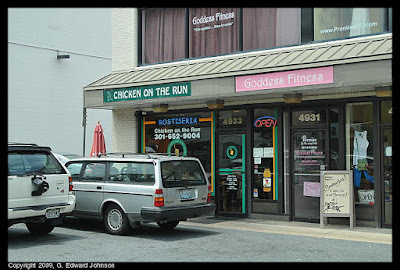 I have been meaning to go to Chicken on the Run for about 6 months but somehow never got around to it. Earlier this week I finally made it. 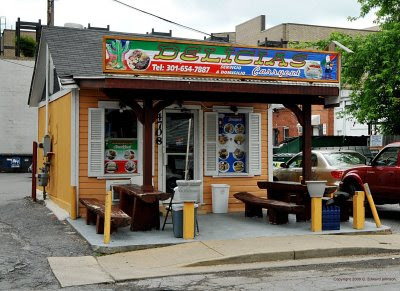 They serve charcoal roasted peruvian chicken and a number of different sides. Service is very quick, it takes too long to cook this to order so they have it pretty much ready to go. For sides I had the salad and the fried plantain. They also have french fries, yucca, rice and beans, coleslaw, potato salad and mashed potatoes. The chicken was delicious, the charcoal and spice flavor had soaked through the whole chicken and it was tender and juicy. the fried plantains were incredible, hot and a bit gooey on the inside and lightly carmelized on the outside. The salad was a bit of a let down though, it was iceberg lettuce, cucumber, and tomatoes with a few shreds of carrots, it didn't have very much flavor. 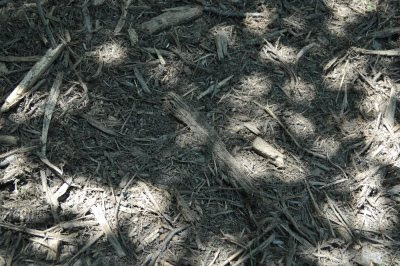 Photo by twitpic user davidcorndc. 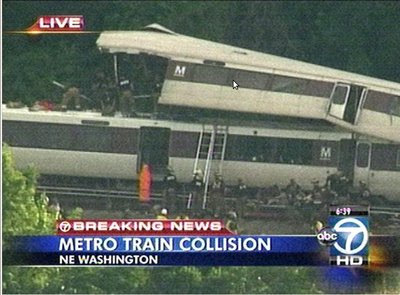 There is still a significant impact from yesterday's accident on metro's Red Line. The red line between Brookland-CUA and Silver Spring is still closed and will remain so for at least the morning rush hour but probably for the whole day. 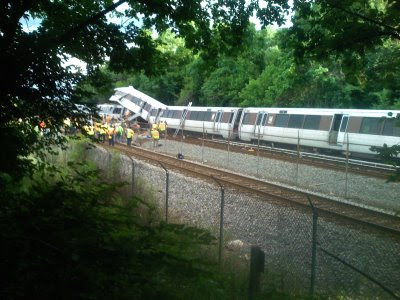 There will be no service at the Takoma or Ft. Totten stations. (The metro website says that Brookand will not have service, but a more recent message on twitter says that it will be open.) release There will be no MARC Brunswick line service today. Shuttle buses will operate between Silver Spring and Rhode Island Avenue stations, but that will not be able to handle a normal rush hour volume. Your alternatives are fairly limited. They do have bus service but a bus holds about 50 people and a single metro car holds 100+ so it will be a slow trip. You may be able to find a regularly scheduled metro bus line that goes near you want to go, check out the metro link at the bottom of this post. Some roads near the accident are closed. It appears that one train was stopped waiting for permission to pull into a station when another train ran into the back of it just after 5 pm yesterday. Computers are supposed to act as a fail-safe and prevent trains from getting too close to each other but that didn't work. Update 8:35 AM: The death toll was revised down from Nine to Seven. For the past couple of months I've been reading The-Thes, which bills itself as "A New Blog about Bethesda" They've been posting for about 3 months now so I don't know how much longer they can justify that tagline. Anyway, usually they have a post or two a day, lots of them are about upcoming events and there is surprisingly little overlap between it and my blog. I sometimes check their blog more than I check my own. (I have to check my own blog to see if I have done any somnambul writing, which I was disappointed to learn that I don't). 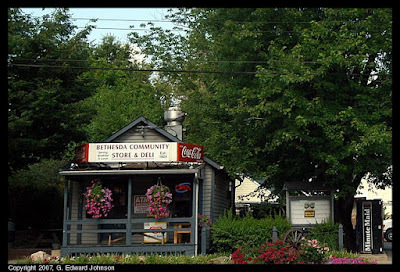 It is great to have another Bethesda focused blog around. I admit I am a little jealous of Silver Spring. 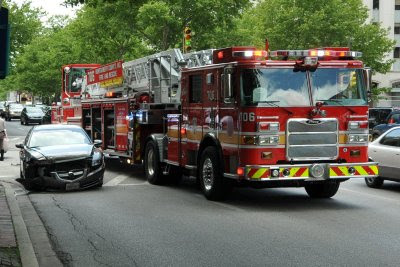 Yesterday a woman was killed by a metro train at the Bethesda Metro station around 1pm. The station was closed for about 20 minutes and there were single tracked for some time after that. Everything is now cleared up. 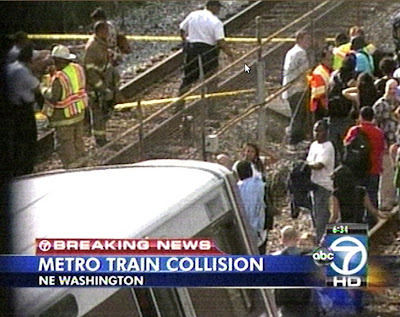 It appears that the woman intentionally got on the tracks. 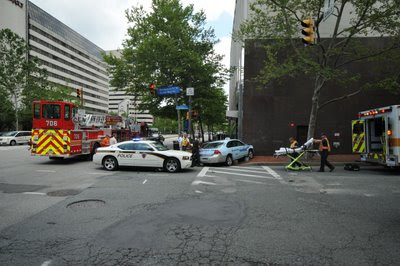 There was an accident today at the corner of Wisconsin Ave (MD-355) and Montgomery Avenue, a cab and a car collided, the cab ran up on the sidewalk and hit a building. It also knocked over a fire hydrant. fire hydrants don't shoot up geysers of water when you knock them over like they do in the movies. 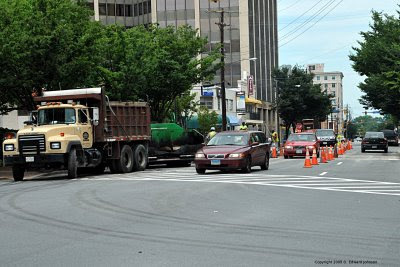 For a short time two right lanes of northbound MD-355 were blocked and two lanes of Montgomery Avenue were blocked. Everything is pretty much cleaned up now, I just saw the towtruck that came to get the cab. 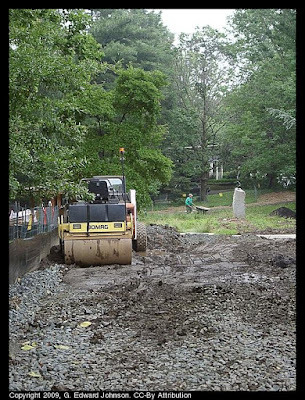 For the past few months they have been totally re-doing the rest area on the Capital Crescent Trail near Bethesda Avenue in Bethesda, MD. It took longer than expected but it is now open and it looks really nice. 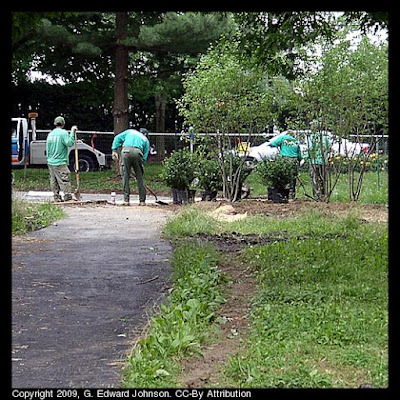 The area has granite pavers, 5 benches and a raised circular area for landscape plantings. The map case and water fountain (including the dog water fountain) are still there but are in new spots. 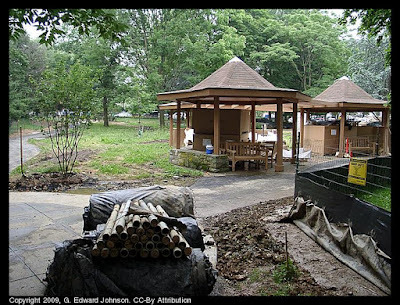 The rest area is dedicated to Linda Weiner who died of leukemia in 2004. Most of the cost was covered by private donations. 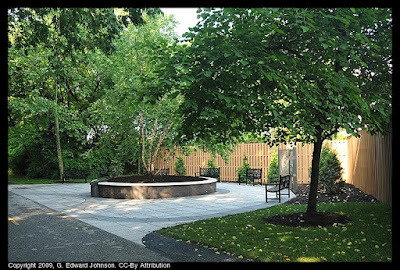 The dedication ceremony was Saturday, June 6th (it would have been Linda's 51st birthday). I'm not sure where the post notices about ceremonies such as these but I didn't hear about it until I read it in the gazette. I went to the Imagination Bethesda festival today to see how it was. 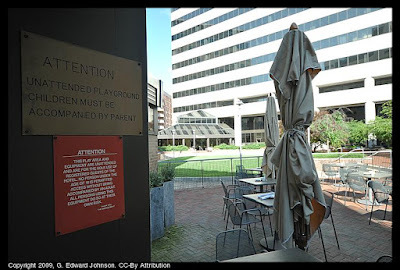 They had closed off part of Woodmont Ave and Elm St in Bethesda, MD. There were lots of booths for kid-oriented stores and services like Tea with Mrs. B, and Imagination Stage, pretty much every booth had some sort of activity for the kids, lots of coloring and gluing going on there. There was also a stage and I watched "The Funny Guy" (Paul Hadfield) do his comedy/juggling/unicycle bit. He did a great job involving the kids, everyone seemed to be having fun. If you have a young kid and you missed it this year, look out for it next year, it is well worth going to. At the beginning of May, Ride-on had their "Give and Ride" food donation drive, you gave food, diapers and stuff instead of paying to ride the bus. The results are in. Over 5,700 pounds of food were sent to the Manna Food Center, a Rockville-based non-profit organization that distributes food to the County’s neediest residents. Another thing to add to the list of things to do this weekend. Davis Library (on Democracy Blvd, across from Walter Johnson High School) is having their Sixth Annual Community Day. There will be fire trucks, magic, stories, a book sale, Oh Susannah! 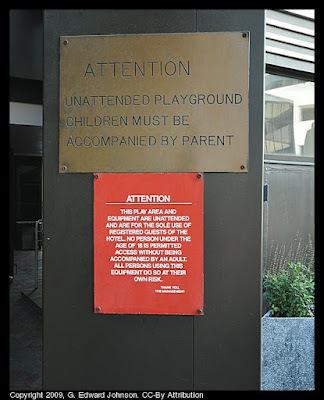 (children's entertainment) and more. For more information call Davis Library at 240-777-0922. Find the schedule here. You can also see the official event information, but it is basically useless. You can recycle your old electronics and computers this weekend for free, more info at the county's website. 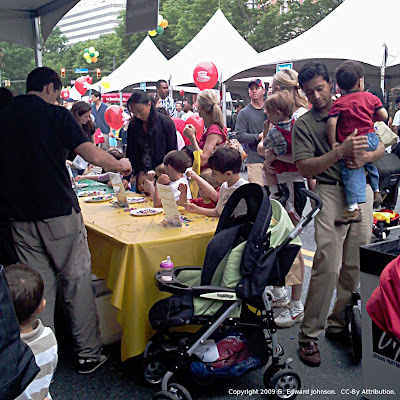 On Saturday from 11am to 4pm is Imagination Bethesda, a children's street festival. 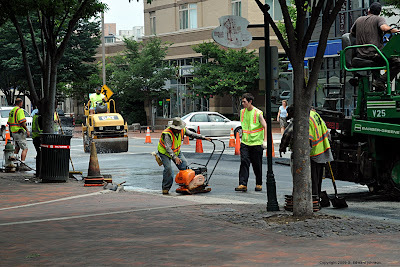 It will be on Woodmont Avenue between Bethesda Avenue and Elm Street. There will be live entertainment, hands-on activities, face painting, balloons, and more. Every once in a while you see something that is so out of place that it defies explanation. 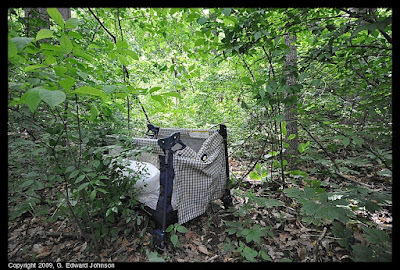 I was walking along the Capital Crescent Trail near Little Falls Parkway and saw a side trail. I followed it a bit and came to this Pack and Play sitting there. Aside from a bit of water and mildew, it was in good condition so it isn't like someone just tossed a broken one out. If you aren't familiar with them, the are like the playpens of old but they fold up, the bent side in the one in the picture isn't broken, it is supposed to fold there. Another odd thing was that the trail was well defined but it didn't seem to go anywhere, it just petered out after a while. On an unrelated trail, Cycle Jerk, ran across A toaster and percolator from the 50's.